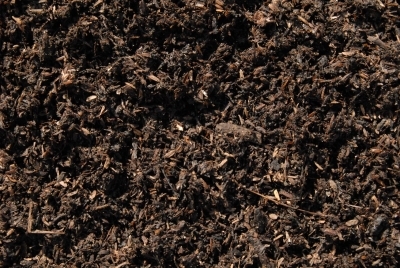 We provide inventories of trees or under-story vegetation for Municipalities, Developers, Campuses and the Private sector for general land use planning. A.B.C. Consulting Arborists LLC also offers tree-related policy development and implementation services. We can be a valuable adjunct to your planning team, by assisting surveyors in completing accurate tree surveys, and by working with architects and engineers to meet environmental standards and ordinances. For Municipalities using Tree Plotter Inventory Software We can collect GPS/GIS data, as well as assessments of value, condition, or other data, for inclusion in databases used for long-term management. Tree Plotter is a subscription-based, lightweight web/mobile GIS software platform built using the leading open source technologies. It is fast, flexible, easy to customize, and as our client references will tell you, remarkably user-friendly with excellent customer support. Tree Plotter replaces traditional GPS-based inventory with Geo-spatial, cloud-hosted technologies. TP is the most accessible tree management software on the market. Access your data from any web-enabled computer, laptop, tablet, or phone on any web browser. Many tree software programs include features and tools you will never use, but not with Tree Plotter. Tools and utilities can be turned on/off for specific client’s software needs. You have direct access to an administration panel for creating unlimited user accounts with varying levels of administrative privileges and read/write capabilities. There are no added costs or limits on the number of users or seats/licenses or editing in real-time. Inherently, Tree Plotter provides an easy-to-use, visual map of tree data to the public with ease-of-use and simplicity. Guest access level cannot add, edit, delete, or move tree points (i.e. read-only), but can view basic tree information (fields chosen by the County) and environmental benefits (e.g. I-Tree information). Guests will not will able to see sensitive data such as tree risk, work orders/history, call information, etc. Create tree labels for maps and adjust the size/color/orientation, etc. A “Tree Dashboard” summarizes key information from trees/work orders into categories of Tree Diversity, Health, Management, Size/Composition, and Ecosystem Benefits. Ecosystem services and benefit values are calculated based on i-Tree research per tree and summarized for all trees. Benefit values are re-summarized after a filter by attributes and/or location is applied (e.g. benefit of large ash trees in a subdivision, school, etc.). 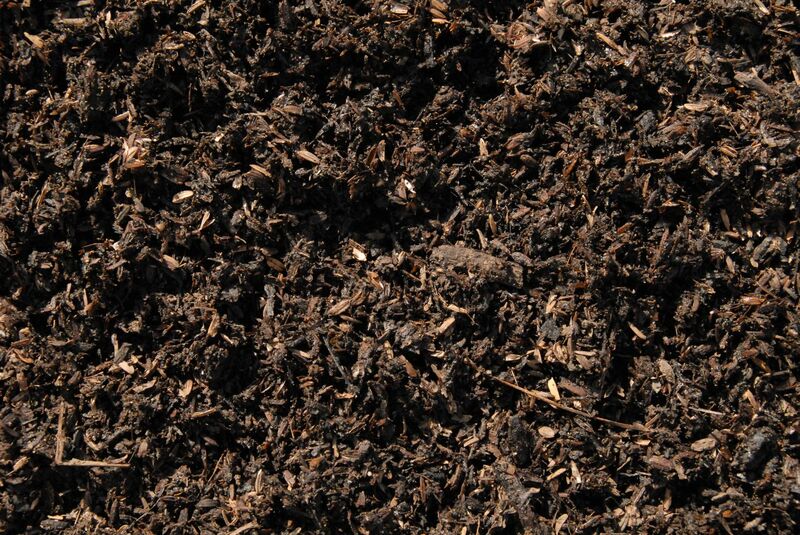 Unlike stagnant programs on the market, TP is constantly improving with user feedback. An offline app for disconnected editing is in development with release in Q3 2016. Everyone within our team knows how to use Tree Plotter and provide technical support, training, demonstrations, and contribute to the product’s usability. Initial training via live demonstration is provided and new or prospective users can attend free training sessions no less than once per quarter to see what’s new, request for training on specific tools, and even hear ideas from other users or contribute ones. They are recorded and available on our website for later viewing. One of our core tenets is unmatched support and responsiveness. Ask our clients. 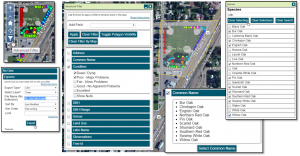 As GIS professionals and web/mobile app developers, TP’s powerful but user-friendly tools allow you to update multiple trees at a time (“Mass Update”), search for specific trees in the map and/or by attributes (“Advanced Filter”), work with data in a tabular (table) view for sorting, filtering, and exporting, and admin-level users can edit lookup tables (park names, species types, etc.) for tree field values as needed. Other GIS “reference” layers can be added to Tree Plotter, either by importing shapefile data or by consuming web feature services from the County’s existing GIS environment. Examples include parcels, street center lines, address data, street light poles, etc. Export data for free to Esri .shp for use in GIS and .csv for use in MS Excel. Many other vendors charge for a service that should be free. After all, it’s your data, not ours. 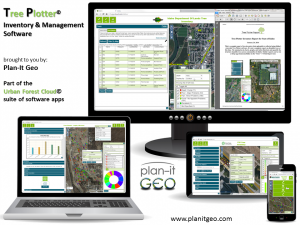 Subscription Options and Cost … Plan-It Geo typically offers Tree Plotter software in 1- and 3-year subscriptions. Tree Plotter is in-line with other industry software programs and Plan-It Geo offers many flexible pricing structures. Unlike other programs, we do not charge “per user” or for the ability to export your data. Value Add … unlike most programs, Tree Plotter is built for easy customization. We can offer value-added items for free or for a cost now or down the road. By itself, Tree Plotter only tracks basic work history of individual trees. Work Order Management (WOM) is an add-on module to Tree Plotter software for entering work orders (WO) and service requests. 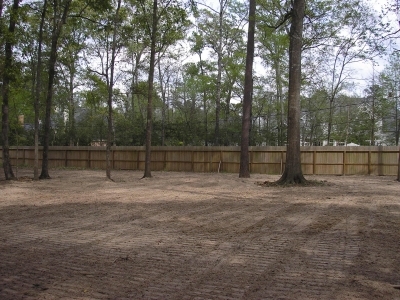 It provides a complete work history tracking of trees and much more. WOM adds several buttons, utilities, and interfaces to Tree Plotter, described/shown below. With WOM, users create a work order (with or without an associated service request), link trees from the inventory data into a WO, and print / email it. Users choose which tree and work order information to include when printing and how to customize a map of the trees with labels (see below). Once the tree work is completed, the status of the work order is updated and so are the associated trees in the inventory database. There are tools to help you do it quickly. Photos of the location and scanned PDFs of completed work can also be attached to WO records. “Quick buttons” from a Welcome page (see next page) allow crews or contractors to update the status of a work order, prompting admins to review the work and close / archive the WO after updating the trees in the inventory database. Additionally, the public can submit service requests to the city admin. As the issue is inspected, a determination is made, and the work is completed, email alerts can be sent back to notify the resident. These functionalities can be turned off, if preferred. Training is included with WOM purchases and the price is a one-time fee, i.e. the cost is not applied when purchasing a new Tree Plotter subscription. Tree Plotter is a subscription-based, lightweight web/mobile GIS software platform built using the leading open source technologies. It is fast, flexible, easy to customize, and as our client references will tell you, remarkably user-friendly with excellent customer support. Tree Plotter replaces traditional GPS-based inventory with geospatial, cloud-hosted technologies. Examples below and on the next page illustrate some of the tools and interfaces of Tree Plotter.